Kristi Noem promised today that I’d be no worse than the fifth person she tells when she makes a decision on the 2018 governor’s race. That’s not bad, when you consider she’s first gotta tell her husband, Bryon, and then her three kids. It’s only fair that they be the first four. And I’m not sure if she really did the math in her head today after a brief news conference in front of Sioux San Hospital, when I changed the subject from Indian Health Service health-care challenges to the 2018 governor’s race. I’ve been pestering the Republican congresswoman quite a bit on that point. As I’ve said before, I expect Noem to be a candidate in the Republican gubernatorial primary race. I also expect state Rep. Mark Mickelson of Sioux Falls and Attorney General Marty Jackley of Pierre to jump in, which would make for a lively primary. I know Jackley’s running, even though he hasn’t announced if officially. I assume Mickelson is, too, although I’m not nearly as well acquainted with him as I was to his dad. And, after today, I really expect Noem to announce her candidacy for governor by the end of the year. I figured that before. It makes sense to announce in, say, early December, then get a big influx of donations before the year-end reporting period. Add some of her campaign cash at the federal level (which can flow down to state races, even thought state cash can’t flow up to finance federal campaigns) and she’ll be tough to beat for campaign cash coming out of the blocks. What she has said about a governor’s race, and what she said today, does nothing do discourage my expectation. The next race? Now, she could mean the next race for reelection to the House in two years. Or maybe Commissioner of School and Public Lands. But I don’t think so. And it makes sense that she would get the November election behind her, but then make a decision and, I’d expect, an announcement on that “next race,” the one for that nice big office on the second floor of the South Dakota Capitol. Starting about Dec. 1, I’m going to keep my cell phone charged and ready. It was the Keltgen Seed cap that captured my attention. You don’t see those much anymore. And this one looked almost new. A pleasant-looking fellow named Raymond Schweiss was wearing it this morning on a replay of Due North Outdoors, a Fox North show I watch from time to time. I was in the kitchen, scrambling kale and sweet pepper and egg whites and sipping jasmine green when I glanced up at Raymond and his cap — and his wrens. A Keltgen Seed cap always catches my eye, because it’s been so long since Keltgen Seed was a fully functioning seed-corn company. My former father-in-law, Keith Keltgen, founded the company with a group of five courageous associates willing to depart from well-paid, secure jobs at what had been called Trojan Seeds — before it was acquired by Pfizer Genetics — in Olivia, Minn., for an adventure that would be a challenge and a success. I’d like to stop here and tell you how I saw Olivia Newton John in Olivia, Minn., once back around 1980, when she followed a whim and an invitation to appear at the town’s appropriately named Corn Capital Days. But this is about the cap and the wrens, and some other recollections. Between the time Keith Keltgen — appropriately known to those in corn country as the Corn Doctor — started Keltgen Seeds back in 1977, I married his daughter, Jaciel, and soon also fell in love with her family, parents Keith and Bev, and seven siblings. We were married 12 years (almost all of them, in my opinion, good years), had two kids and divorced in predictable misery but about in about as amiable a way — since we both did our part in the failure of our marriage — as is possible. Our kids benefited from the fact that we have never really stopped caring for each other, to this day. Nor did we ever hate each other, or act like we did. Jaciel and I benefitted from that, too. That’s another story. Back to the cap, and the wrens. Keith played an essential role for me, filling in for the father I lost when I was 16. It was an unreconciled, unfathomable loss that left me spinning through my formative years in a sort of untethered search for a father figure and for kind of peace and perspective. Keith was there when I desperately needed him. We hunted and fished together, celebrated family events together, argued sports and politics together and spent time at the Keltgen factory together, as he explained the genetic imperatives of corn breeding and sales, as well as the essential of human interaction. Keith and I stayed close after the divorce, and I was part of the family at St. Aloysius Catholic Church, where Jaciel and I were married, for Keith’s funeral in1999. The Keltgen hats, once so common and comforting across the farmlands of Minnesota and South Dakota, diminished with time. So did the Keltgen Seeds signs at farm driveways. So now when I see a sign or a cap, I connect again with the man and the family who will always matter to me. Raymond Schweiss clearly took good care of his brown cap with the gold K on the front. It looked to be one of those stylish corduroy models that Keith included in his diverse collection of promotional items. So I had to stop and watch the show, about Raymond and the wrens he loved and tended on his neat, Minnesota-style farm outside of Fairfax. My mother, Marie, loved wrens, too, and enjoyed the same “music” that Raymond talked about. And they’re always happy, if you judge joy by their song. So I spent some time, tea in one hand and fork in the other, standing in front of the kitchen TV, watching Raymond and his hat and his wrens and thinking about my own mother and her wrens and my only ever father-in-law (Mary’s dad, Red, had died before we got together) on this earth. It warmed me like the tea, settled me like the sound of wrens in the backyard at Chamberlain, or the loving weight of Keith’s strong hand on my shoulder and his even-stronger words in my memory. Near the end of the show, the wrens flew south, silencing Raymond Schweiss’s neatly managed farmyard, and he bid them farewell until the following spring. I wondered then how many springs Raymond Schweiss had left, at 79. And I learned a few seconds later that he died a few weeks after the segment was shot. I was saddened by that, of course. And that sadness called up the deeper essence of more profound and personal losses that I — like you — carry every day. And, oh, how rich the layers can be, including the sadness and the joy of recollection found in a TV image of a hat, a old farmer and the music of wrens. And while Raymond Schweiss won’t be there waiting next spring on the backyard step, the wrens will return, navigating on ancient instinct back to the place of their origins, offering their chittering call to happiness. If only we have the ears to listen. Here’s what I think about John Thune and Hillary Clinton. Just like Barack Obama in 2008, Thune thinks she’s likable enough. He won’t say that. He can’t say that. But I’m pretty sure it’s true. Thune dislikes Clinton’s political philosophy. And he’s probably put off, as I am, by her unwise use of a personal email server while she was Secretary of State and by her ongoing inability to just speak straight about her missteps there. But on a personal level, I assume Thune likes Hillary Clinton. There’s nothing he has ever said, on the record of off, to lead me to believe otherwise. Just recently, when asked about Clinton at a Black Hills Press Club luncheon, Thune remembered when they served together on the Senate Armed Services Committee. He said she always came well read, well prepared, well informed on the issues before the committee. That’s about as nice as he can afford to get. Thune also repeated a story I’d heard years back, that being that he had spoken to Clinton following the 2008 primary, she told him how she enjoyed campaigning here and how her win in South Dakota was one of her favorites. That brought a general chuckle from the mostly Republican crowd. A long-time Black Hills Democrat, former Catholic priest, Franklin Hotel Owner, travel mogul and current Democratic National Committeeman from South Dakota, Bill Walsh did support Obama in 2008. But he’s a big Hillary backer in this campaign. Thune isn’t a Hillary backer, obviously. But having known him for 25 years or so, I have no doubt that he likes Hillary Clinton on a personal level better than he likes Donald Trump. Other than certain points of politics, Thune and Trump are miles apart as people and politicians. Trump is rude. Thune is polite. Trump is insensitive toward people, ultra-thin-skinned and crude and mean-spirited in his rhetoric. Thune is the exact opposite. Trump condemns the political system and continues to show ignorance in how the government system actually works. Thune is a knowledgeable part of both systems and wants to improve them, not destroy them. All indications are that Thune is a good guy at heart. I’ve seen no such indications from Donald Trump. The Republicans had a chance to nominate a number of genuinely good people and qualified candidates for president, and they picked Trump. That puts people like Thune, a leader in a party that Trump belongs to in name but often not in actions or rhetoric, in a difficult spot. For example, as Donald Trump continued to slog through self-destructive exchanges over Muslim Gold Star parents a few days back, I caught up with Thune down in Pine Ridge. After discussing tribal law-enforcement problems and IHS health care, I asked Thune if he thought it was time to move on from the issues around the appearance at the Democratic National Convention by Khizr and Ghazala Khan. Thune seemed to include the DNC planners when he said it was wrong to politicize the loss of lives suffered by Gold Star families. But it was more clearly a nudge for Trump to move away from that particular fire and toward potentially productive campaign issues. But Thune said he hopes for a lot more than familiar persona from Trump. “I believe that people are ready for change. I don’t think they want to continue the status quo, which is what Hillary represents. But he’s got to demonstrate that he can articulate a positive agenda for the future of this country that addresses the very serious challenges that we have. And if he can do that, I think there’s a pathway for him to win the election. I asked Thune if he could ever see himself saying what Trump said about Putin and Obama. Which his way of saying, “no, I could never say that; I would never say that,” without actually saying it. What I wonder is this: If Trump continues to campaign with rhetoric that has little to do with concrete issues and so often crashes through the lines of propriety as Thune sees them, how long will he be able to not say it? We could get a chance to find out. That’s a “runner” for a news reporter. You run out of the newsroom and run to your car and race as safely and legally as you can to the site of the news. It was horrid, that site — and its sights – at the corner of Anamosa and Greenbriar in North Rapid City. Officer Tim Doyle was badly wounded, and being rushed from the scene. Officer Ryan McCandless was dead. Officer Nick Armstrong was mortally wounded and would die later in the hospital. Their assailant, 22-year-old Daniel Tiger — a young man I’d seen in Mass from time to time years earlier at St. Isaac Jogues Church, tending lovingly to his grandmother — had pulled a gun and opened fire during what started out as a random check for an open container in North Rapid City. Tiger suffered wounds in the return fire that would prove fatal. So much that day was tragic: The deaths of two young officers with their whole lives ahead. And the terrible turn of a young man who surely had promise but got lost on the edges of society and turned increasingly angry and addicted and eventually so deranged that he ended his own life by taking the lives of others. I still feel the emotions of that day, and the loss of those two young officers — a loss that is so much deeper and more profound for their fellow officers, and especially for the loved ones who must carry it every day. I grieve today for who they might have become and what they might have meant in this community and this world. They already were and meant a lot. I carry their memory with me, and always will. But I also think of Daniel Tiger, about what good might have waited for him in a different world or with different opportunities and the sustaining salve of hope. I grieve that terrible turn he took and the loss that his family suffered that day — a loss that they, too, carry with them every day. Darrick Koch of Watertown holds the pending state-record salmon — 31.54 pounds — caught last Friday on Lake Oahe near the face of the dam. The record is pending because Geno Adams, GF&P’s fisheries program administrator in Pierre, has been out of the office and won’t be back in until Thursday. He’s the guy who signs off on new state-record fish. 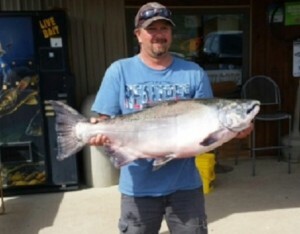 But the fish was weighed on a certified scale and confirmed as a chinook salmon by a GF&P fisheries biologist. So the “pending” seems simply to be a formality until Adams gets back in the office. Anyway, there’s nothing pending about the excitement such a beast creates in the South Dakota salmon-fishing club. First, Paula Hawks is no dummy. She knows how to feed cattle, combine corn and introduce high-school students to the intricate world of the mitochondria. Unlike the aforementioned Lloyd Christmas, Hawks is not desperate for a date. She has one, for life. Her husband, Steve, is an SDSU physics graduate with a West-River-ranch upbringing and East-River-farm expertise. They’re a pretty good team these days, as Hawks — a two-term Democratic state House member — runs for the big House in Washington, D.C.
Will she be a one-and-done congressional candidate after she loses to Kristi Noem in November. In the event that she doesn’t lose – beating some pretty substantial odds — would she move to the D.C. area? Her answers: No, and yes. I liked both of them. One: Any Democratic candidate for South Dakota’s lone U.S. house seat should be prepared to lose. That would include former Congresswoman Stephanie Herseth Sandlin, although she could also be prepared to win, because she’d be close to an even bet. Anybody else this side of say, Tom Daschle, would be in the position Hawks finds herself in: Trying to make a good showing, and almost certainly not winning. But would she then disappear like, with respect, Matt Varilek did after the 2012 race and Corinna Robinson did after the 2014 campaign. That’s not how the Democrats are going to retake that seat. Our Saturday morning Old Man’s Breakfast Club had concluded by consensus – there’s no such thing as unanimous at the club, with the possible exception of mass concern over PSA levels – that any Democratic candidate for the U.S. House seat in South Dakota should prepare to run a four-year campaign. Two to get things started, and two more to get serious about winning. So when Hawks joined us for breakfast and political chatter (Kristi Noem, John Thune, Mike Rounds, we’ve got a seat waiting for you! ), that was one of the first things we asked. Yeah, OK, whatever. But here’s the answer that mattered: She’ll be around next cycle. Build a base. Expand name ID. Develop funding sources. And be prepared to run against, oh, maybe Shantel Krebs or Dusty Johnson in 2018. You know, somebody like that. Noem? Naw. She’ll be running for governor, possibly in a three-way primary with Attorney General Marty Jackley and state Rep. Mark Mickelson of Sioux Falls. OK, I’m not entirely certain on that. But this is a blog, where running off at the mouth is expected. Even so, I’ll be surprised if Noem doesn’t run for governor, and Mickelson and Jackley are likely GOP candidates for that primary. Whatever happens there, Hawks will be a more experience, more competitive Democratic candidate in the general, if she’s in it. That’s good, and not just for Democrats but for the state. I don’t know that the ridiculous imbalance of power in South Dakota created an environment where EB-5 and Gear Up could happen. But it didn’t help. Ridiculous imbalances tend to be, well, ridiculous. So suppose Hawks would win in 2018. Next up is the where-to-live decision. It used to be assumed that people who ran for Congress in South Dakota were prepared to move themselves and their families to the D.C. area. That was a life’s commitment that everybody in the family had to make. That ended, pretty much, in 2004, when John Thune beat Tom Daschle with a barrage of criticism that included Daschle’s D.C. residency (the Jaguar in the driveway didn’t help, either, I suppose) and allegations that he was out of touch with South Dakota. That’s a debatable point, perhaps for a later thread. But since defeating Daschle, Thune has played the “I’m a resident of Sioux Falls …” game, with his family living in Sioux Falls in reality and him living there in a sort of dreamy mix of reality and political theater. Meaning he spends a lot of time on planes, flying to and from his home in Sioux Falls to his residence and job in D.C. Many weeks there. Most weekend here. Noem has done the same thing — at some cost, I think she would admit, in time she’d want to spend with her family. Rounds, without kids at home, came into the “I’m a Fort Pierre resident…” routine without quite as much to sacrifice. But he’s away from his wife and adult children and his grandchildren during the week, as Noem is away from her husband and at least one child at home. Is it worth it? I wonder. Hawks thinks not. Noem would argue that she’s more than part-time at both responsibilities. And I know she has worked hard and flown often to make as many of her kids’ events as possible, while trying to keep in fulfill work obligations here at home and in D.C. Thune did the same. Still, it’s kind of part-time parenting. It has to be. Is the sacrifice worth it? Only they can say. But Tim Johnson, whose family joined him in the D.C. area, where Johnson was a resident for most of his 28 years in Congress, wanted to be home with his family during the week, not just on weekends. He also thought connections between congressional members – including those of the opposite party – were easier to keep when more people stuck around on weekends, sometimes socializing together with their families. I suppose these days that would be considered evil socialization. But living there subtracted those rushed flights on Friday and Monday, or sometimes Tuesday and Thursday, allowing – Johnson argued – more work time and some personal connections. And he never seemed to lose touch with what we were living with and hoping for here in South Dakota. So it worked pretty well, it seemed to me, before 2004, for Democratic and Republican congressional members. Hawks thinks it could work well again. “If we look back to representatives and senators who moved to D.C., they were doing a good job of representing the state and still coming back to do constituent work,” she said. There’s quite a bit of time for that, during what seems like an endless array of congressional breaks. And Daschle, for example, worked to maintain both the appearance of being connected at home and the reality of it by trying to hit all 66 counties every year and by making his annual, extended driving tours – often by himself, or with a reporter – across the state. I rode along on a few of those. And I can tell you, they meant something — to him and to the South Dakotans he spoke to along the way. Hawks likes that idea, or something similar. And she’d love a chance to give it a try. Which brings us back to that pesky, expensive, uphill U.S. House campaign – the one that will really matter, in 2018. Not long after Mike Rounds made the Janklow-Trump comparison, lightning struck and I lost power – along with the interview notes on my computer screen. Yeah, yeah, I know. I should have been saving those notes. But sometimes when an interview gets good, as this one did, a guy gets busy asking question and pounding the keys and forgets about hitting the “save” key. Have to admit, right there I thought of Russell Means, who said a couple times in the months leading up to his death he wanted to come back as lightning and strike the White House. I think of Means regularly when lightning strikes. You don’t suppose he took a shot at Rapid City, when he heard Trump and Janklow in the same sentence? Anyway, with the computer flashing like it was shot with a rifle, I grabbed a pencil and scribbled down what I could remember to that point, including a couple quotes, and asked for help in reconstructing a few others. But much was lost. Whatever the age and rank, Thune, Rounds, and Congresswoman Kristi Noem have been working on the Indian Health Service medical-care fiasco with passion that mostly seems to transcend politics. Obviously, the fact that by bashing the IHS the Republican congressionals indirectly get to bash the Obama Administration is a sweet GOP bonus. But there’s real outrage and concern there, too, with good reason. IHS in this region in particular is a mess. While there is certainly good care being provided in some instances, it fails in others. Hence the closed ER at the IHS hospital in Rosebud and long, dangerous and — some tribal members say — in some instances deadly delays in critical treatment as ill or injured patients are rushed to other hospitals. There are plenty of reasons for that, including a stone-walled institutional structure in IHS that makes it as bullet-proof against transparency and responsiveness as any agency at any level I have covered. There might be good people doing good work inside the figurative and literal walls of IHS, but you’d never know it. I’d have better luck getting an interview with a member of the Politburo than getting into the office of whoever is in charge at Sioux San Hospital here in Rapid City, or other IHS facilities in Rosebud or Pine Ridge, with my camera rolling. And they probably kind of should be when real national security is at stake. But what’s at stake in the IHS works is health and lives. And openness, not secrecy, is the way to help protect those. Add funding shortfalls the IHS can’t control, the complicated relationships between the federal government and the sovereign-yet-dependent tribes, throw in some politics, mix in profound health-care challenges among tribal people and the isolated reservation landscapes and you’ve got health-care dysfunction beyond your imagination. All at the expense of tribal people. The 2nd highest rate of infant mortality among all IHS regions. The lowest life expectancy rate at 68.1 years as compared to the U.S. average of 77.7 years. The highest age adjusted death rate (1301.5 per 100,000 is higher than IHS average of 953.7 and U.S. average of 776.5). IHS allocates less than 0.4% of its total budget to equipment purchases. It appears only one-third of IHS’s roughly 15,000 employees (full time or equivalent) are dedicated to front-line health care professionals (doctors and nurses, for example). Of its 15,000 employees, IHS has more than 3,700 people dedicated to Medicaid billing (25%) while only 750 people are identified as doctors (.05%). More than that, Rounds says IHS isn’t even particularly responsive to the tribes when it comes to crucial decisions affecting the tribes. Money is a factor, too. And just about everybody agrees the troubled region needs more of it. Rounds says the funding formula doesn’t’ seem to make sense or have a structure, other than what has previously been given to the agency and to a region. I’ve said before and continue to content that the IHS lost a great opportunity when former South Dakota Sen. Tom Daschle withdrew name from consideration for health and human services secretary. He had issues to deal with in being confirmed by the Senate. But they could have been overcome had Max Baucus, then a Democratic senator from Montana and alleged Daschle friend, been truly supportive and had the Obama Administration been more resolute in backing Daschle. Knowing both the D.C. system and the IHS system, especially in this region, Daschle would have meant real change for the better. But we have what we have, including an apparent commitment of the state’ Republican delegation to force improvements. Rounds says an independent audit is needed, and he’s encouraged by IHS cooperation there. He will join Thune and Noem this Friday in Rapid City for a field hearing on IHS issues by the U.S. Senate Committee on Indian Affairs and its chairman, Republican Sen. John Barrasso of Wyoming. The hearing won’t be the end of the IHS inquiry, however. Now, when you think “cooperation” don’t you think Janklow, and Trump? That’s not exactly what moved the interview to those two. Actually, I wanted to talk Trump with Rounds even before the Senate hearing came up, so I tagged some questions on to the end of the interview. Like Thune and Noem, Rounds has endorsed Trump (last I knew, Gov. Dennis Daugaard still had not). And I guess I can understand the endorsements, since the billionaire is almost certain to be the GOP presidential nominee, and these folks play the political game at the national level, where partisanship is most, well, pervasive. But, I asked Rounds, whose political life has been represented by polite commentary and the general rejection of name-calling and personal invective, if he wasn’t troubled by Trump’s vulgarities and pejoratives and personal attacks. Doesn’t it make Rounds uncomfortable? That’s been my experience with Rounds, on and off the record. My experience with Janklow, on and off the record, was much different – especially off. He said things on the record that would make a half-drunk cops reporter blush. Mostly, but not always, he was more careful on the record. But he still crossed lines of rhetoric than Rounds wouldn’t have crossed. As a state Senate leader, Rounds worked with Janklow on many initiatives and admired his performance as governor, if not always specifics of his public rhetoric. “There were times when I’d walk into his office and say, ‘Bill, why did you say that?’” Rounds recalls. If you loved Janklow and loved his Wild Bill style, and plenty of South Dakotans did, you also embraced some of what he said that some might have considered over the line. He was pretty good at personal attack. And great at bullying. I can’t imagine, though, that he ever would have suggested we ban all members of a religious group from entering the country or spoken about a reporter with disabilities the way Trump did. Then there’s the other thing: Janklow was extraordinarily bright and knowledgeable on the law, politics, government and just about any other subject he found interesting (from catalytic converters to black holes in space to the impacts of music on the developing brain of a fetus), something even his supporters would have trouble honestly saying about Trump. Yet, you did have to look past some things to work with Janklow. Rounds did just that. And he seems to be prepared to do the same with Trump – up to a point. My guess is that in the coming months Rounds will have plenty of opportunity not to, again. And again. Luke Leingang, 13, of Pierre took this monster paddlefish over the weekend on the Missouri River near Chamberlain, fishing with his dad, Aaron. 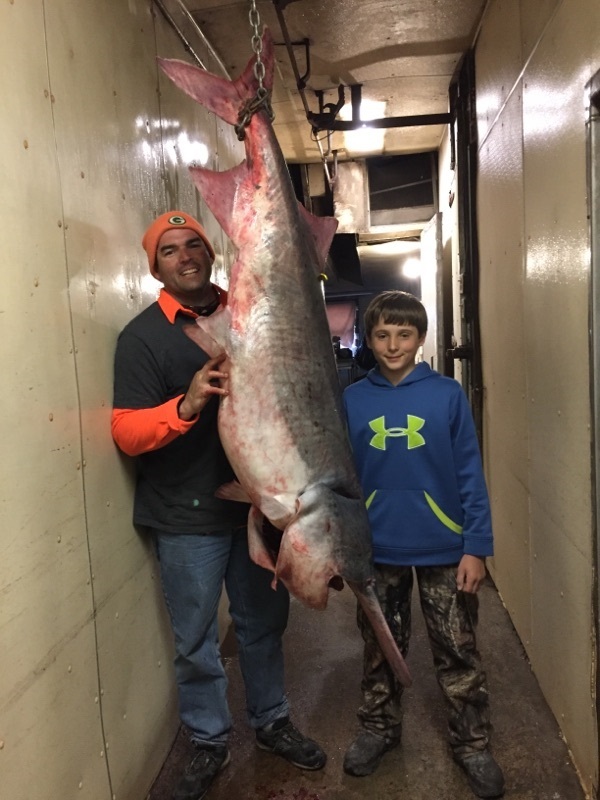 At 127 pounds even, it was nine ounces shy of the state record. His dad awarded him the unofficial bronze in South Dakota paddlefishing. But Aaron Leingang was wearing gold-medal pride at the monster paddler his 13-year-old son, Luke, hauled out of the Missouri River last weekend. “Long story short, after a crazy circus we got the fish landed after close to a half-hour ordeal getting in and out of the boat and under and around the boat,” Aaron wrote in an email announcing the catch. But that didn’t mean the work was finished. You don’t weigh that thing with a hand scale, or a bait-shop scale, for that matter. I know that locker well. It’s a place where hogs go to die. And this was a hog, with a paddle. “It came up 9 ounces short of the state record,” Aaron writes. I remember that fish. Bill Harmon caught it a couple years back in May, also from Lake Francis Case — where the hog paddlefishing is done in South Dakota these days. 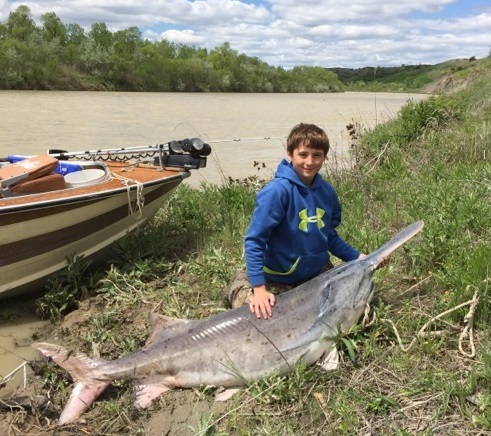 But that means Luke is third in the state paddlefish ranks, which still earns plenty or praise from his pop. “I told Luke he’s now the bronze medalist of paddlefishing in South Dakota,” Aaron says. It’s not surprising, either, that Luke’s fishing buddy is another Pierre kid named Michael Jackley, who has been on this blog a number of times with hefty fish. Those two could be on their way to the pro-fishing circuit. During a week when prominent Republicans across the nation have been screeching to a halt short of endorsing presumptive GOP nominee Donald Trump, Gov. Dennis Daugaard is hitting the brakes himself. “I’m not there,” he said yesterday during a chat outside the state Game, Fish & Parks Commission meeting at Creekside Inn in Custer State Park . “There” is giving his support and endorsement to Trump. Don’t get the Republican governor wrong. He’s not planning on supporting Hillary. But Trump? Trump? Well, the look of misery on his face at the mere question indicates a level of discomfort that, in existential terms, seems close to what he’s been experiencing physically from the ruptured disk in his back. Which hurts worse, the ruptured disk or Trump’s success? I couldn’t tell by looking. As Daugaard says, he has a ways to go to get there with Trump. And he’s not alone. So does U.S. House Speaker Paul Ryan, who said much the same thing this week. Not there. And when asked if they’d support Trump, W and HW apparently begged off in a way that seems to indicate their road to “there” might be long and bumpy and perhaps impassable. I could easily see either one casting a vote for Clinton, even if they didn’t admit to it. Daugaard says that regardless of where he is on the road to Trump – or some alternate route — he won’t be able to beg off on his convention vote as an elected delegate from South Dakota to the Republican National Convention in Cleveland in mid-July. I think I caught a wince as he spoke the words, and it wasn’t the back. It’s clear that Daugaard wishes he had another Republican option to Trump. “He offers simplistic solutions to complex problems, and makes ridiculous statements,” Daugaard said.